Forecast Discussion: Tuesday, April 23: As a cold front moves through central Ohio, moderate southwesterly to westerly winds will effectively disperse pollutants, and mostly cloudy skies and isolated thunderstorms will limit ozone formation. As a result, AQI levels will be Good. Wednesday, April 24: Increasing sunshine will enhance ozone formation in the Columbus region. However, light northerly winds will bring clean, cool air into the area, keeping AQI levels Good. Thursday, light southerly winds will limit dispersion and gradually transport pollutants and moisture into central Ohio. These conditions will increase particle production, leading to high-Good AQI levels. Friday, another cold front will move through the Columbus region early in the day, enhancing mixing and dispersing pollutants. Therefore, AQI levels will be Good. Saturday, surface high pressure moving into central Ohio will produce light winds, reducing pollutant dispersion. 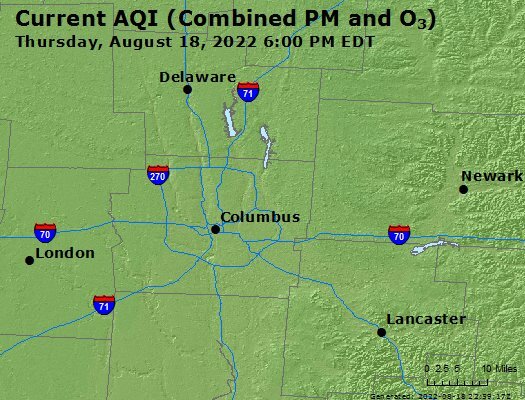 Furthermore, mostly sunny skies will enhance ozone formation. As a result, AQI levels will be high-Good. Sunday, as a low pressure system moves through the Buckeye State, moderate southwesterly winds will shift to northwesterly, keeping the atmosphere well mixed and leading to continued Good AQI levels.